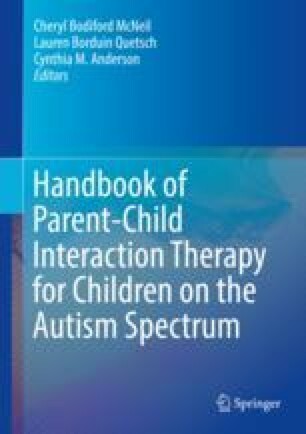 This chapter will provide several handouts for parents to help tailor Parent-Child Interaction Therapy (PCIT) skills to manage autism spectrum disorder (ASD)-related behaviors (e.g., repetitive play, sensory dysregulation, insistence on sameness, poor social skills). Handouts cover how to manage ASD-related behaviors within the context of PCIT’s two phases: Child-Directed Interaction (CDI) and Parent-Directed Interaction (PDI). The chapter will additionally provide strategies for clinicians to help parents generalize skill acquisition to the home (e.g., additional considerations for setting up Special Time practice) and community environments (e.g., using CDI skills throughout the day). This chapter and the accompanying parent handouts aim to provide information for clinicians to best support families of children with ASD in generalizing these skills to manage ASD-related behaviors. Autism Spectrum Disorder, or ASD, can affect your child’s ability to interact and play. Children with ASD aren’t trying to be difficult, their brain works differently which means they see and understand the world in a different way than most people. This can be hard for many parents to understand because children with ASD have trouble with things that may come naturally to you. They may have problems communicating, being social, and playing with other people, especially other kids. They may also show certain behaviors that can seem “odd,” off-putting, or disruptive. Some parents find it helpful to learn more about their child’s ASD-related behaviors so they can respond with more patience, understanding, and compassion. While ASD tends to look pretty different from one child to the next, here is a list of behaviors you might notice. Trouble with verbal (talking) and nonverbal (eye contact, gestures) communication. Not noticing social cues/rules, like interrupting when you are talking with someone else. Not offering to share or take turns in play or when talking. Trouble noticing how other people feel, or telling people about their own emotions. Not knowing how to play with toys, or may play with them the same way each time. Would rather play alone than with other people. Making unusual noises or saying the same thing over and over. Moving hands or body in unusual or repetitive ways. Becoming upset when moving from one activity to the next. Trouble with sudden changes in routines or schedule. Strong or “obsessive” interest in certain toys or topics. Getting easily overwhelmed by loud, new, or crowded situations (like shopping malls). Having strong, sometimes sudden emotional outbursts and trouble calming down. Children with ASD live in a social world that may be confusing and overwhelming. This can lead to anxiety, acting out, or avoiding new situations. 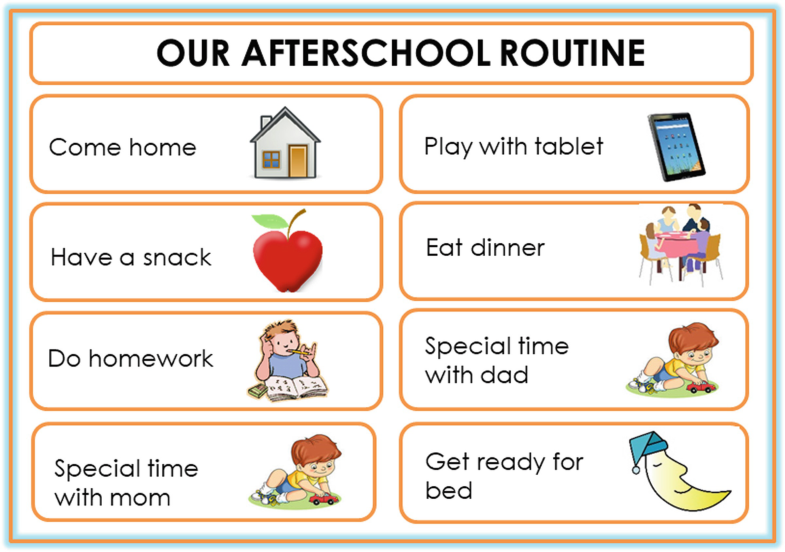 This may also make it difficult to engage, play with, and enjoy your child during Special Time and throughout the day. Even with these challenges, children with ASD often have unique strengths—attention to detail, excellent memory, logical and rule-oriented personality—all of which make PCIT a great treatment choice for you and your child! The strategies you learn in PCIT can help you make the world a little bit more predictable for your child and make it easier for you to feel connected to one another. Play is hard work for children with ASD. These “on the job” tips may help answer some of your questions and make it easier for your child to play and enjoy being together during Special Time. Finding the right toys to engage your child is very important. You will want to follow the guidelines explained by your PCIT therapist during the CDI Teach, but it is also helpful to give some extra thought about the specific toys you put out during Special Time. Picking toys that will catch your child’s attention can help make the play more fun for everyone. Put out one toy you know your child will really like, and then choose 1–2 more toys that might be interesting to him or her. It some cases, it might be a good idea to have the same toys every session so your child knows what to expect. Once your child gets used to playing with other types of toys, you can remove or replace his/her “preferred” toys with different ones. Sometimes children get “stuck” on a specific toy. While playing with this toy, he/she may show more problem behaviors that make it harder to get his/her attention or interact. In this case, you may need to put this toy away during Special Time. Try to have other, similar toys available. For example, if your child really likes cars and enjoys watching the wheels spin, choose a different set of vehicles with similar features like a helicopter. Try to avoid toys with set instructions (like a Lego manual), or remove the instruction booklet, as children with ASD can become really focused on following the instructions. Putting in a little extra effort in setting up the area in your home used for Special Time can go a long way. Children with ASD can be more sensitive to specific “sensory” parts of their world. If your child gets upset by bright lights, choose a room with dim lighting. If he/she is distracted or startled by noise from the room next-door, set up a fan or white noise machine to soften those sounds. A smaller room with less clutter or distractions may also make it easier for your child to focus and sit still. It may help your child feel calmer to always use the same room for Special Time. For children with ASD, play is work—it might not come as naturally to them. Try to pay attention to how your child is acting during Special Time. Sometimes children with ASD need some “warm up” time or may take longer to enjoy play. Just an extra 1–2 minutes in the beginning of Special Time where you play alone, or side by side, with your child may help give him/her time to settle in and be more open to play time with you. During the “warm up,” keep an eye on your child and look out for signals or “clues” that he/she is ready for some of your attention again. If he/she starts using some of the toys you have in front of you, or says something to you about the toys, that might be a good clue that your child is ready to accept some PRIDE skills. It might be a good idea to keep your statements short at first (for example, “Nice sharing,” “Good building,” or “Thanks for telling me”). When children react poorly to your efforts to interact, you might be tempted to try harder to get your child’s attention. It is important to resist this urge. Your child is trying to tell you that it is too much right now—that his/her brain needs time to process. Even though it is hard to hold back, it might help to wait quietly and patiently for your child to be ready. Taking deep breaths, telling yourself “he’ll play with me when he’s able,” and focusing on what you are doing can help you stay calm and resist the urge to jump in. Taking the time to warm up helps show your child that you are listening to their signals, and accepting how he/she is able to play right now. As your child warms up to Special Time, you may notice more talking, sharing of toys, sitting more calmly, and interacting more with you. It may take some time to get to that point though. For some children, it could take only 1–2 minutes, for others, it may take a few weeks. By taking the time at the beginning—listening to your child’s cues, using a few PRIDE skills here and there, and being very consistent with Special Time practice—you will get there and it will be well worth the time and effort you put in! How you respond to your child’s ASD-related behaviors can help him/her learn new ways of playing and talking with other people. Just because a skill is difficult for your child right now does not mean it has to stay that way! It just means we may need to work a little harder to help him/her learn things that may come more easily to other kids. As you are learning in PCIT, your attention helps teach your child new skills! When you reward a behavior with your attention, you will see more of that behavior. So, we want to notice “positive opposites” of challenging behaviors. The positive opposites we want to pay extra special attention to are ones we may all “take for granted,” or expect to see. Little things like looking at you, talking with you, playing with you, using greetings, and saying “please” and “thank you” may come naturally to you, but chances are they are really hard for your child to do consistently. That is why they need a little extra encouragement and help from you to learn them. Sometimes it can be hard to find something positive to praise, especially when it seems like your child does not really want to play with you. On the other hand, it can be pretty frustrating when he/she only likes doing the same thing over and over again. We can slowly help your child learn to play differently by meeting your child where he/she is at right now, and raising our expectations little by little, over time. This may take a while, but if you stick with it, your child will be able to learn these skills. What if your child doesn’t seem to know what to do? Well, then you might have to SHOW him/her first. We call this “modeling.” You can demonstrate the positive behavior you want to see. This can work really well when trying to teach new skills like imaginative play and coping with strong emotions. Behavior does not change overnight. It takes a lot of planning on your part to help your child learn new skills. Children with ASD often learn new skills at a slower pace and may take a while to show those skills consistently in different environments. Be patient. Try and take a step back and look at the “big picture.” It can be easy to focus on behavior from just one day, but try to think about what Special Time practice was like a week ago, or two weeks ago instead. Notice the “little victories.” Maybe today your child seemed pretty “stuck” on a certain way of playing, but he/she was so much calmer when things did not go his/her way. Sometimes it can be hard to catch positive changes in one behavior when your attention is focused on another. Your child is so lucky to have you on his/her team, committed to a treatment that will help him/her learn. It may take your family some time but PCIT will help your child develop new play and social skills, and the rewards will be well worth the wait. Stick with it! Children with ASD need extra practice and reinforcement to learn social skills. As you get more practice with the PRIDE skills during Special Time, you may find that you start to use them naturally throughout the day. Using PRIDE skills (especially Labeled Praises for Positive Opposites) during different times of the day can help your child carry over the good behaviors you are starting to see during Special Time to other social situations. Unfortunately, though, generalization, or the “spreading” or “expansion” of skills is not automatic. And children with ASD tend to have an especially difficult time with generalization. Deliberately setting up opportunities for your child to practice social skills outside of Special Time can help your child generalize the good behaviors he/she learns with you in Special Time. This will help him/her better relate to and play with other people beyond parents. Look for natural opportunities throughout the day to use PRIDE skills. Start by making a point to notice Positive Opposites in your child at home throughout the day. It may be easier to just pick one or two “target behaviors” to look out for during the day. If your child has a really hard time staying calm and using words to communicate needs or frustrations, you might try to notice these types of behaviors in situations that are especially challenging. It also can be helpful to deliberately plan “low-pressure” situations where you can point out and praise positive behaviors you see in your child. These are settings where he/she is most likely to show good social skills because they are the most familiar or the child has enough adult support. Maybe invite an older cousin or nice classmate over for a playdate, or go to a favorite park. Set up play activities you know will be fun for your child. Stay with or near your child so you can catch him/her using good social behaviors. The most reliable way to generalize skills is to teach your child (through your praise and positive attention) with as many different examples as possible across people, settings, and behaviors. The more you notice and praise these good behaviors throughout your child’s daily life, the more meaningful and long lasting these positive changes will be for him/her and your family. See Alternative CDI Homework Sheets: “Using CDI at Home Throughout the Day” and “At Home and in Typical Life Situations” to help guide your practice and keep track of your progress with using PRIDE skills throughout the day. Did you spend 5 min in Special Time today? Did you practice using PRIDE skills at home outside of Special Time? List examples of Labeled Praises. What types of home activities? Did you practice using PRIDE skills during other activities at home? Did you practice using PRIDE skills in typical life situations outside of the home?